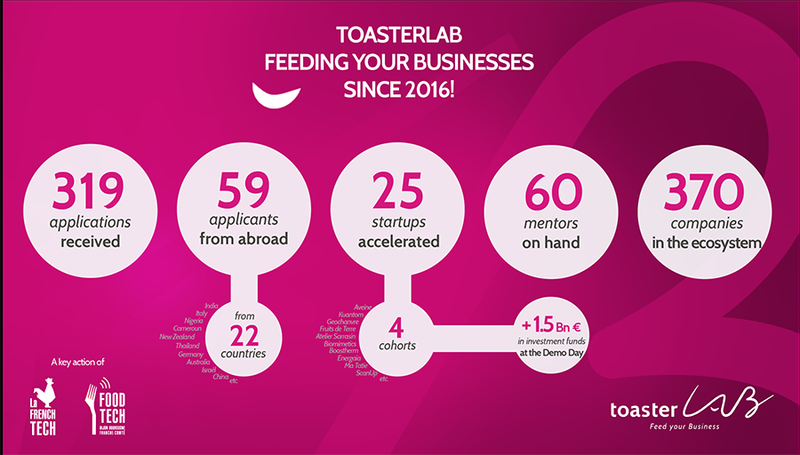 Last July, ToasterLAB's jury of founding members  selected the seven new startups who make up the program's 4th acceleration cohort. A number of different topics - plant proteins, recycling food waste, urban agriculture, supply chain, blockchain etc. - are on the menu for building tomorrow's food businesses. The program's 4th call generated 92 applications, including 23 from outside of France. The seven startups selected will begin their acceleration on September 19th. The 12-month program will allow them to speed up their market launch and industrialisation. In partnership with Terres Univia and GEPV, the 4th cohort of ToasterLAB includes the two winners of the Prot'Eat contest: Tartimouss ! and Life Loving Foods. This contest had the goal of detecting and accelerating innovative projects using legumes and plant proteins in food products. Clémence Carbonnel, R&D project manager for Atelier du Fruit, gives her feedback on the acceleration support her company received during the 3rd cohort: "Intense! Each each, we we taken out of our comfort zone. We learned a huge amount. Thanks to ToasterLAB, we have been able to clearly define our business model, to get to grips with regulatory aspects, and to better structure our financial and sales strategy." from entrepreneurs in France and abroad, with 319 applications received from 4 calls - and 59 applications from outside of France during the last two application calls. from investors. A total of more than 1.5 billion Euros in investment funds was present at the last ToasterLAB Demo Day. Life Loving Foods produces vegan versions of popular dishes such as kebabs, tandoori, panna cotta, or protein-rich cookies, using soy, pea and wheat proteins. https://lifelovingfoods.com. The founding members: Vitagora, Caisse d’Epargne de Bourgogne-Franche-Comté, Crédit Agricole Champagne-Bourgogne, GEPV, Groupe Dijon Céréales, Groupe Seb, Terres Univia.